This real coin from South Africa, the size of a U.S. half dollar, is first layered in pure bright silver. Then the figure is highlighted and brought to life with rich pure 24K gold (this gold work is done by hand). This breathtaking and exclusive work turns the coin into a stunning and true work of art. Each coin is hermetically sealed against wear in a clear, hard acrylic coating and comes in a jewelry box. The coin comes mounted in a patented hinge type clip that will hold just one bill or a number of bills. (Now that last bill won't slip away.) Please Note: The gold and silver is much brighter and distinct than what the photograph shows. This real coin from South Africa, the size of a U.S. half dollar, is first layered in pure bright silver. Then the figure is highlighted and brought to life with rich pure 24K gold (this gold work is done by hand). This breathtaking and exclusive work turns the coin into a stunning and true work of art. Each coin is hermetically sealed against wear in clear, hard acrylic coating. Each coin comes with a gold filled plain edge bezel, on a copper rope chain layered in 14K gold and placed in a jewelry box. Please Note: The gold and silver is much brighter and distinct than what the photograph shows. This real coin from South Africa, the size of a U.S. half dollar, is first layered in pure bright silver. Then the figures is highlighted and brought to life with rich pure 24K gold (this gold work is done by hand). This breathtaking and exclusive work turns the coin into a stunning and true work of art. Each coin is hermetically sealed against wear in clear, hard acrylic coating. The coin comes with a gold filled rope edge bezel, on a copper rope chain layered in 14K gold and placed in a jewelry box. Please Note: The gold and silver is much brighter and distinct than what the photograph shows. This real coin from Britain, the size of a U.S. quarter, is first layered in pure bright silver. Then the figure is highlighted and brought to life with rich pure 24K gold (this gold work is done by hand). This breathtaking and exclusive work turns the coin into a stunning and true work of art. Each coin is hermetically sealed against wear in a clear, hard acrylic coating and comes in a jewelry box. The coin comes mounted in a patented hinge type clip that will hold just one bill or a number of bills. (Now that last bill won't slip away.) Please Note: The gold and silver is much brighter and distinct than what the photograph shows. You often see shirts, caps and jackets that feature logos from your favorite collegiate and professional sports teams. Now you can add high quality jewelry products to the list! You will love the exciting collections available for each school and team! There are more than 300 universities and sports teams to choose from so you can build a collection that is perfect for you. Logo Art manufactures the broadest and most elegant collection of collegiate and sports licensed jewelry products ever. Most products are available in 14k gold and sterling silver. To see a list of all necklaces available, click here . To order separator beads, click here . The majority of the pendants and charms can also be made into rings, earrings, tie tacks, cuff links and key rings. Please contact Online Sports at 1-800-856-2638 for availability and pricing. Following is an example of what you can do with pendants, charms, and separator beads to make a very unique gift or team spirit item. The image shown is representative, the item that will be shipped to you will be the same design but in Sterling Silver. You often see shirts, caps and jackets that feature logos from your favorite collegiate and professional sports teams. Now you can add high quality jewelry products to the list! You will love the exciting collections available for each school and team! There are more than 300 universities and sports teams to choose from so you can build a collection that is perfect for you. Logo Art manufactures the broadest and most elegant collection of collegiate and sports licensed jewelry products ever. Most products are available in 14k gold and sterling silver. To see a list of all necklaces available, click here . To order separator beads, click here . The majority of the pendants and charms can also be made into rings, earrings, tie tacks, cuff links and key rings. Please contact Online Sports at 1-800-856-2638 for availability and pricing. Following is an example of what you can do with pendants, charms, and separator beads to make a very unique gift or team spirit item. 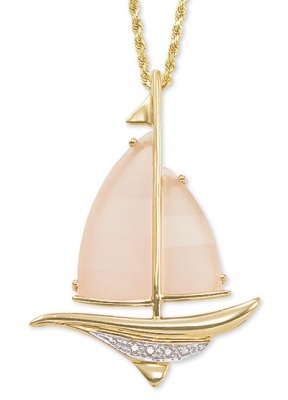 "Rose Quartz and Diamond Sailboat Pendant"
"It?s smooth sailing with this Rose Quartz and Diamond sailboat set in 14kt gold. (PE5109) $249.95. Pendant measures 1 3/4'' long by 1 1/4'' at the widest. Also available with Blue Topaz - please specify when ordering. Chain not included ? please see below." It's always a beautiful day at sea with this 14K Gold Sailboat Charm. Charm Weight: 1.8 grams.